I’d like to think it’s true, since for some strange cosmic reason, I’m never friends with any of my exes. I tried once or twice and it didn’t work out well. Maybe they’re still in love with me, but I highly doubt it, because it’s more to do with me putting zero percent effort in staying in touch. There are times when I can be so aloof and cold towards people I no longer have affection for that it’s scary for those who like me. Hell, I don’t even like the way I behave towards people sometimes. I can be so bewildering unemotional that I scare myself whenever I think about it. One of my exes said something similar to me after an argument. She said I had a wall so high that when she tried breaking it down (or scale over), I kept findings ways to prevent her from doing so and one day she would eventually get tired of trying. Long story short, she did stop trying. That was mainly because I had a self-destructive streak in me which made me believe that I had to try all ways possible to make someone jump through blazing hoops to prove they truly love me and would never leave me, no matter what destructive behaviour I exhibit. Sick huh? I know. The 2013 me is a new and improved version of that 2008-9 defective me. I had a similar conversation with this another girl who was truly in love with me (I think… Even though she was with someone else at that time), but the 2010 me refused to give her a proper chance, because I didn’t think she was right for me, so I subconsciously declined her advances. I mean, if she could cheat on her partner with me, the likelihood of her cheating on me when we do get together would be really high. First, I wouldn’t trust her and my insecurity would be obvious in my behaviour, which would have made things unpleasant between us. Plus, I wouldn’t want my karma debt to go further into deficit. It’s weird how karma works, doesn’t it? How the things/misdeeds I did to others were repeated on me. Like I accidentally took this novel my ex-girlfriend loaned me because she wanted me to read one of her favourite books. Shortly after, we broke up and I never had a chance to return it to her. So it’s been on my bookshelf for the past four years and I still haven’t read a single page of it. Maybe I should message her on Facebook soon and see if I could post it back to her. Why have I brought this up? Because the exact same situation happened to me recently. I loaned my favourite Kokology book to this former love of mine, because she loves it and I wanted to make her happy because I thought we’d be together forever. So in a way, I was renting it to her. Alas, we broke up months later and I never had the chance to get that book back. 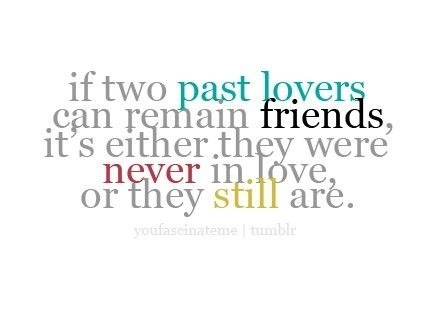 If two past lovers can remain friends, it’s either they were never in love or they still are. I’m just going to console myself by thinking that all my exes are somehow in one way or another secretly in love with me, because through knowing and loving me I have inexplicably changed their lives for the better. I’m a life-changer. They just don’t know it yet.